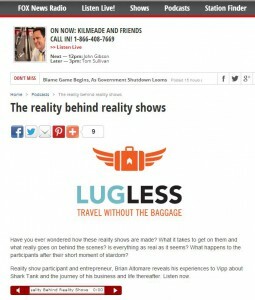 Congratulations to our Client LugLess for their feature on FOX News Radio. As seen on Shark Tank, LugLess is a door-to-door luggage shipping service that will pick up your luggage from your home, hotel, or place of business and deliver it to your final destination. Hear the inside scoop about Shark Tank as reality show participant and entrepreneur, Brian Altomare reveals his experiences to Vipp about Shark Tank and the journey of his business and life thereafter. Listen Here. LugLess makes it easy and affordable to get your luggage to its destination safely, economically, and most of all on time! Check them out at LugLess.com.